I have j ust read my first e-book! The novel itself is not up for review, (its The Choice by Suzanne Woods-Fisher, in case you are interested), but the actual reading experience. You see I am a committed print lover, I love the feel of a book in my hand, whether brand new or secondhand. I love turning over the pages, folding over corners to mark my place in the absence of a bookmark. Being choosy about book covers – I have a preference for books that don’t feature the film poster as the cover. I like the original artwork thank you. For me nothing beats a hardcopy novel. Even when friends and colleagues started switching over to the Kindle and iPad, I remained steadfast. Viva la print, and reading books in the bath! Then I got my new HTC phone. Ok so it’s smaller than a Kindle or iPad, but having stumbled across the Reader app, with it’s nicely thought of free e-books courtesy of Kobo, I thought I’ll give it a shot. And to my immense surprise I really enjoyed the experience. I felt like an Amish person discovering the forbidden joys of modern conveniences (incidentally the book I read was about Amish people, so forgive the analogy). First of all it was surprisingly easy to read, I say this because I don’t usually enjoying reading on screen. I am the fiend who has no consideration for the environment before printing off documents to read. But here I was on the bus faithfully reading away bitesize chunks of text on my small screen (I think that actually helped), and not losing the enjoyment of reading and quite liking the fact that I could slide to the next page. Bookmarking was still available and if I forgot, when I returned to the Reader, it very helpfully went to the page I was last reading! All in all a pretty good experience. However, I don’t think I be giving up on books completely, in favour of the e-versions. There is a nostalgia attached to books especially if you are re-reading them, that I think is missing from e-books. It’s just not the same but that, as I’ve discovered doesn’t necessarily make it bad. Also, I read a comment somewhere in the case against e-books, which I totally agree with: With e-books, gone are the days in which you can nosily glance at what your fellow passengers on the bus or tube are reading, a pastime I quite enjoy. Plus you can’t read e-books in the bath – way too risky! Posted on 22 September 2011 15 March 2018 by queenpea77Posted in ArticlesTagged articles, books, e-books. I agree with your point about the movie poster book covers. They should be treated as more separate entities…Glad you’re enjoying the world of eBooks! Welcome to the world of eBooks! I’m right there with you. I’m a die hard ‘paper in my hand’ gal, but I have to say, since getting an eReader for christmas, I’ve read more books in 9 months than I had in the 2 years prior. And… dare I say it… I’ve even dabbled in the world of the audio book. I LOVE it. I’d love to hear your thoughts on that literary experience soon! Audio books review, coming soon! 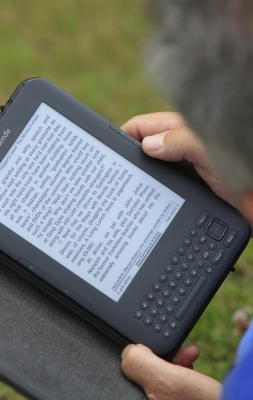 On e-books there is something about them that makes reading easier and somehow simpler. I’m putting it down to accessibility. Oh dear, all of us die-hard physical book lovers are turning traitor, myself included. Amazon offered me the chance to download a free Kindle for PC, and although I thought I would not like reading electronically, since it was free, I decided there would be no harm done. To my surprise, I discovered that I didn’t mind reading from a screen, and since a lot of classics were available for free downloads, or at very low prices, like US$2.00 I’ve ended up reading a load of books I probably would not normally buy. However, I still love to hold a physical book in my hands and to see them lined up neatly on my bookshelves, so I still order my physical copy of any book I think I will love. But I’m afraid that we are going to wake up one day in the future and find that we can no longer get proper books and that everything will be only available electronically. At least those of us who have a good library will own collector’s items and be able to command our own price to people who really want to hold a book in their hands, just like my old vinyl LPs and disco 45s!